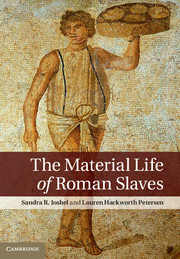 S. R. Joshel, L. Petersen, The Material Life of Roman Slaves, Cambridge, 2014. The Material Life of Roman Slaves is a major contribution to scholarly debates on the archaeology of Roman slavery. Rather than regarding slaves as irretrievable in archaeological remains, the book takes the archaeological record as a key form of evidence for reconstructing slaves' lives and experiences. Interweaving literature, law, and material evidence, the book searches for ways to see slaves in the various contexts – to make them visible where evidence tells us they were in fact present. Part of this project involves understanding how slaves seem irretrievable in the archaeological record and how they are often actively, if unwittingly, left out of guidebooks and scholarly literature. Individual chapters explore the dichotomy between visibility and invisibility and between appearance and disappearance in four physical and social locations – urban houses, city streets and neighborhoods, workshops, and villas.